« You can buy Dell in Taiwan? Sale! Sale! Sale! 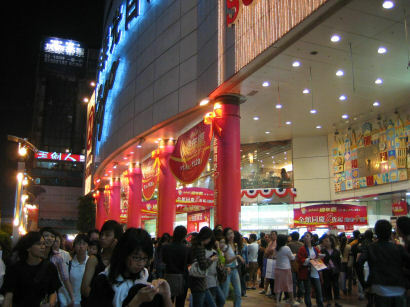 That’s been the buzz-word this month with Sogo holding their yearly anniversary sales. The women go crazy and buy mountains of stuff and the poor guys are left to hold their bags. 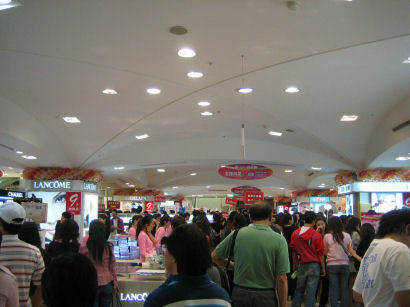 There’s no way the women can resist the urge to shop when things are 20% store-wide and deals such as spend NT$30,000 and receive a NT$3000 voucher or buy a mascara for $2300 discounted from $2500, and receive a lip gloss, eye liner and toner as gifts. With over 10,000 people jammed into the store you don’t walk, you shuffle. It doesn’t just stop there. There are promotional giveaways at certain times. The queues for these go out the back door and into the adjacent park. People are literally lining up in the bushes just to get a free gift. Must be quiet in the other departments stores the last 20 days. i like your blog..! very informative and witty!